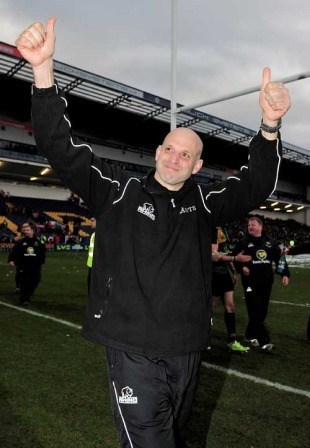 Northampton Saints chairman Leon Barwell will do all he can to keep Jim Mallinder at Franklin's Gardens. Saints rugby director Mallinder is among the favourites to succeed Martin Johnson as England manager following Johnson's resignation yesterday after three-and-a-half years in the post. Mallinder has previously worked in a coaching capacity with England Saxons and England Under-21s. The 45-year-old Yorkshireman's Saxons reign produced 15 wins from 16 games, while he led the under-21s to Six Nations title success. Mallinder is currently under contract with Saints until the end of next season. Since he joined Northampton in 2007, the club gained promotion back into the Premiership, won the European Challenge Cup and Anglo-Welsh Cup, reached two Premiership semi-finals and last season's Heineken Cup final. "Clearly I would not want him [Mallinder] to leave - that is a no-brainer," Barwell told the Northampton Chronicle and Echo. "There is nothing official from the RFU [Rugby Football Union]. We can only speculate as to what will happen next and who they are looking at. "Clearly, Jim is a first-class coach and is bound to be in the running for the England job. We will just have to deal with it as to when and if it materialises. Jim and I are in very close contact, and as events unfold we will talk about it and make the right decision. "At the moment the RFU is still reviewing events and it is not clear as to what is going to take place. The process cannot begin until a structure is sorted out, and we will find out that within the next few days and weeks. But I would try to persuade him to stay. It is a big job for anybody to take on, and we would clearly want him to stay here and continue the excellent work he is doing at Saints. "Jim is an excellent coach, and I think that whatever he puts his mind to he has got that determination to succeed."